American Hustle is loosely based on the '70s and '80s FBI sting operation ABSCAM where agents worked with a conman to target corrupt politicians. Director David O'Russell's madcap crime film is nominated for 10 Academy Awards, including all the top categories: Picture, Director, Actor (Christian Bale), Actress (Amy Adams), Supporting Actor (Bradley Cooper), Supporting Actress (Jennifer Lawrence) and Original Screenplay. 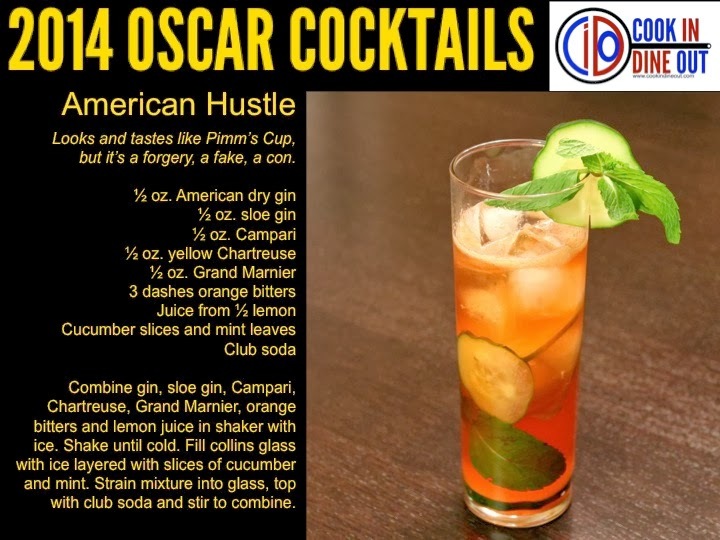 The American Hustle cocktail is inspired by the clever shenanigans in the film. At one point, a character is given a bottle of Pimm's, a spicy/citrusy gin-based liqueur popular in Britain. 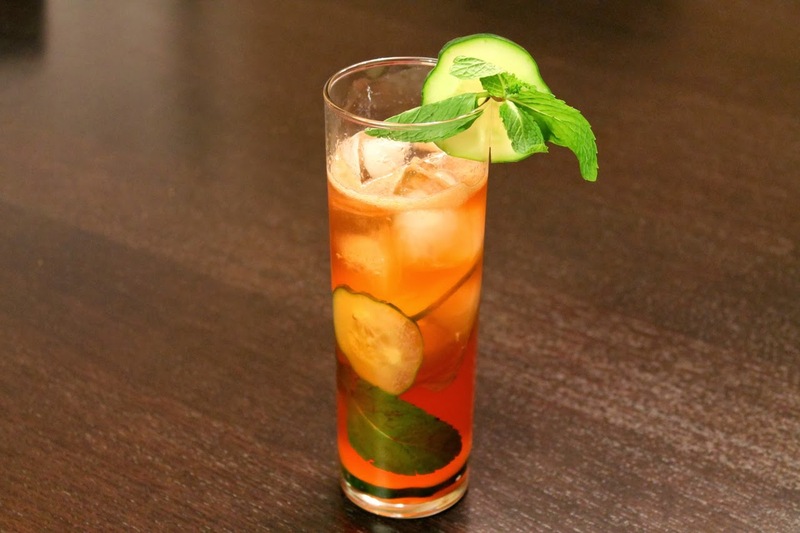 It's used to make the Pimm's Cup cocktail: a mixture of Pimm's and lemonade garnished lovingly with cucumber slices and mint. The American Hustle cocktail resembles a Pimm's Cup and even kind of tastes like it. But...it's a forgery. An imposter. A fake! A mixture of other spirits evoke the herbal, spicy and citrus flavors of Pimm's cup, while lemon juice and club soda sit in for the "lemonade" (which in the U.S. would be more accurately described as lemon soda). If someone were to hand you this drink and you thought "oh, a Pimm's Cup," you've been hustled. American Hustled. Combine gin, sloe gin, Campari, Chartreuse, orange liqueur, orange bitters and lemon juice in a shaker with ice. Shake until cold. Fill a collins glass with ice layered with a few slices of cucumber and mint leaves. Strain mixture into glass, top with club soda and stir to combine. Serve garnished with a cucumber slice and mint sprig. Good movie, good drink. I think I like your "fake" Pimm's Cup better than the real deal.